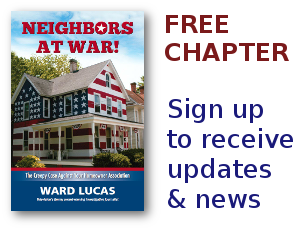 Ward Lucas Archives - Page 3 of 170 - Neighbors at War! Transfer fees are among the biggest scams in the housing business. North Carolina residents tried to get them outlawed. Colorado is trying. New Mexico is trying. Transfer fees are a ‘little’ item on your paperwork that pops up when you try to sell your home. If you live in a Homeowners Association of any kind you’re likely to learn that you have to pay the fee before you can sell to a buyer. Transfer fee. That means some property manager had to photocopy the HOA covenants, probably a hundred or so pages. But you don’t photocopy them one page at a time. No, they’re on his computer. Push one button and the printer spits them all out in a couple of minutes. 1 Comment on You Can’t Make These Things Up! Crazy story from the city of Commerce in Los Angeles County. A community newspaper reported on a growing scandal involving an alleged two million dollar kickback scheme involving the mayor of Commerce and several city officials. At least two of the officials live in a gated community there. Now an HOA board member, in the foulest imaginable verbal assault, has told the newspaper delivery guy that he’s no longer allowed to deliver the paper to homeowners in the HOA. In Greek mythology, the Hydra was a terrifying sea monster that had many heads and used them to devour innocent seafarers. Our hero, Heracles, forced the Hydra into the open and began chopping off its heads. But each time a head was severed two new ones grew back. It seemed like a hopeless task but Heracles was undaunted. He finally figured out that if he used a torch to cauterize each severed limb they failed to regrow.